Health Communications Inc, 9780757319372, 360pp. 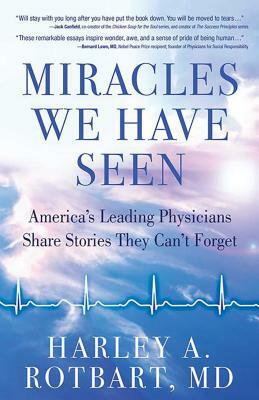 This is a book of miracles—medical events witnessed by leading physicians for which there is no reasonable medical explanation, or, if there is, the explanation itself is extraordinary. These dramatic first-person essays detail spectacular serendipities, impossible cures, breathtaking resuscitations, extraordinary awakenings, and recovery from unimaginable disasters. Still other essays give voice to cases in which the physical aspects were less dramatic than the emotional aspects, yet miraculous and transformational for everyone involved. Positive impacts left in the wake of even the gravest of tragedies, profound triumphs of heart and spirit. Preeminent physicians in many specialties, including deans and department heads on the faculties of the top university medical schools in the country describe, in everyday language and with moving testimony, their very personal reactions to these remarkable clinical experiences. A tiny premature baby dying from irreversible lung disease despite the most intensive care who recovered almost immediately after being taken from his hospital bed and placed on his mother's chest. A nine-year-old boy who was decapitated in a horrific car accident but survived without neurological damage. A woman who conceived and delivered a healthy baby—despite having had both of her fallopian tubes surgically removed. A young man whose only hope for survival was a heart transplant, but just at the moment he developed a potentially fatal complication making a transplant impossible, his own heart began healing itself. A teenage girl near death after contracting full-blown rabies who became the first patient ever to recover from that disease after an unexpected visit by Timothy Dolan, the man who would go on to become the Archbishop of New York. A Manhattan window-washer who fell 47 stories—and not only became the only person ever to survive a fall from that height, but went on to make a full recovery. Harley Rotbart, MD, has been a nationally renowned pediatric specialist, parenting expert, speaker and educator for over three decades. He is professor and Vice Chair Emeritus of Pediatrics at the University of Colorado School of Medicine and Children's Hospital Colorado. He is the author of numerous medical and scientific publications, and books for lay audiences including No Regrets Parenting and 940 Saturdays. Dr. Rotbart has been named to Best Doctors in America every year since 1996, as well as receiving numerous other national and local awards for research, teaching, and clinical work. He serves on the advisory boards of Parents magazine and Parents.com, and is a consultant to national and local media outlets. He is a regular contributor to Parents and the New York Times. Rotbart, an author, speaker, and pediatric specialist, has assembled a collection of essays from top medical professionals in various disciplines that showcase patient outcomes that have defied all expectations and, in many cases, scientific explanations. The essays are written with a blend of technical detail, which fully explains the miraculous events, and a conversational appeal to the unknown, which will engage readers who feel there is more to life than the empirically verifiable. Rotbart's compiled tales capture serendipitous timing, impossible cures, resuscitations, awakenings, moments when the spiritual and physical appear to touch, patients who have paid it forward, and many situations when good emerges from tragedy. Incredibly broad, both in the specialties represented and in the types of miraculous events described, this collection captures the hope that captivated those who experienced the events firsthand. While the technical details of some cases and the sheer volume of case studies may overwhelm the reader, the experiences and perspectives this book contains are sure to provide inspiration.